I love Brandon Mull. I adore his first series, Fablehaven. Absolutely love it. I had high expectations for his new series, A World Without Heroes. I have to say that I was a bit disappointed with the first book in the series. It never really painted a clear, concise picture of Lyrian for me. I’d been expecting something as immediately perceptible and vibrant as the Fablehaven series and book number one didn’t deliver. 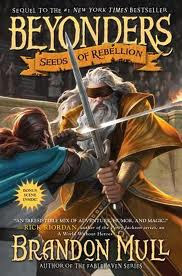 Don’t get me wrong, I liked it, it was good, (good enough for me to buy book two) but I really expected more from Fablehaven’s author. That all out of the way, book two, Seeds of Rebellion did a MUCH better job at making Lyrian come alive for me. This book was nonstop action and adventure. Great continuation of the characters and the storyline. I love Brandon Mull’s ability to create races of people, each so very interesting and unique! There is great counterpoint between Jason and Rachel and even a little bit of a love-interest triangle. I’m excited to see that subplot develop in the next stories. Overall, still no Fablehaven, but I’m really warming up to this series.